I saw Hero Mom on Amazon and I immediately thought of my friend Barbara Gruener who is an amazing school counselor and blogger extraordinaire over at The Corner on Character. I would consider Barbara one of the school counselor experts when it comes to connecting, understanding, and caring for military families and children. Click HERE to read some of the amazing things Barbara has done to honor and acknowledge military families. And today she writes a guest post all about this wonderful new book - Hero Mom. 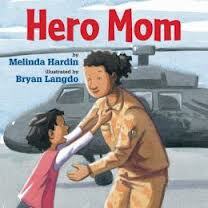 Why It's On Barbara's Bookshelf: From the author of Hero Dad, and just in time for Mothers' Day, comes a book that focuses on the women in military who are not only soldiers, but also moms. Sometimes these hero moms serve close to home. But often times, these hero moms are sent far, far away. When that happens and these women deploy, it requires that they put their job as a mom on a back burner for a bit so they can serve their country. This book is simply powerful because it shines a light on the different jobs a military mom might get to do in a military job. And yet, they are, first and foremost, heroes in their role as mom. Use this book as an avenue for creating an awareness in young citizens about a soldier's sacrifice. These heroes willingly put themselves in harm's way to keep us safe and free. Cultivating respect, admiration, and gratitude for those who serve is a gift we must give our children. That's why last year at this time, we partnered with a local Jewelry Store to send Pamper-Yourself care packages to our deployed soldiers for Mothers' (and Fathers') Day. Our students wrote thank-you notes to these heroes and we sent fun stuff like scented lotions, flavored coffees, and Girl Scout cookies along with the basic-need supplies we'd collected. It felt amazing to support our deployed troops in this caring way. The bonus fun for us happened when we got to watch the soldiers open our boxes from their barracks in Afghanistan on the big screen in our cafeteria as we chatted with them via Skype (just like the mother and child in the book). We found that connecting with them truly was just a click away. This book would also be the perfect lead-in to a Mothers' Day writing assignment; your mom doesn't have to work in the military to be a Hero Mom! Ask your students what their mom does that makes her a hero. Maybe her super power is her smile. Or it could be that she's a trustworthy carpool driver. Her super power might be caring 'cause she's the first one to make a meal for someone in need. Or maybe it's her positive attitude that makes her your hero. Have students draw a portrait of their very own hero mom and write a book, letter, or essay about their mom's super power. It'd also make a wonderful read-aloud at your Mommy Makeovers or Mothers' Day Tea. Enjoy! Barbara Gruener is an elementary school counselor at Westwood Elementary. Barbara is a published author whose work has appeared in magazines such as Teaching Tolerance, Teaching K-8, and Daughters. She also has a wonderful blog full of helpful resources called The Corner on Character and writes for the website Character Counts! Barbara always recommends great reads!